The bug is responsible for an estimated 280,000 cases of food poisoning each year and as many as 100 deaths. The study revealed that Asda was the worst performer, with a contamination rate of 78 per cent. More than one in ten of its packs – 12 per cent – carried the potentially lethal bug on the outside. The second highest contamination rate was for a group of smaller retailers including independent butchers and budget chains like Lidl, Aldi, Iceland and Budgens with a contamination rate of 76 per cent. The Co-op came next followed by Morrisons, Sainsbury’s, Waitrose, Marks & Spencer and Tesco. Earlier this year, retailers mounted a fierce lobbying campaign against the FSA survey. Specifically, they wanted to block the naming and shaming of stores because of the risk to sales and profits. Initially, they were successful after winning over ministers and officials in the Department of Health, DEFRA and even the Prime Minister’s office. 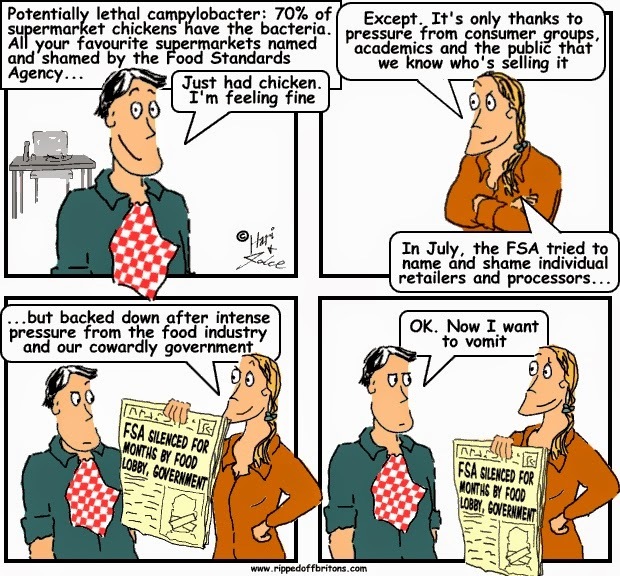 However the FSA decided to publicly shame the stores following pressure from consumer groups, academics and the public. Critics have argued that the FSA and the Government have failed to ensure supermarkets sell safe food – with the commercial interests of stores, processors and farmers given greater priority than consumers’ health. The illness associated with the bug has enormous economic costs in terms of lost days at work and NHS treatment. Some estimates put this bill at £900million a year.